Inspired by a Finnish legend, Kullervo was Sibelius’ first large-scale symphonic work. 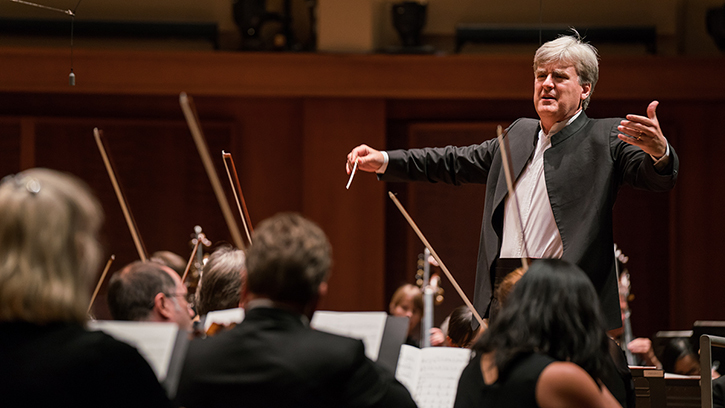 Thomas Dausgaard leads a journey into Sibelius’ roots of inspiration for Kullervo with the Seattle Symphony on May 31, June 2 & 3. Every great story must begin somewhere, and for Finnish composer Jean Sibelius, his story begins with Kullervo, his first large-scale symphonic work. Inspired by a legend from the Kalevala, the Finnish mythology, Kullervo is a tragic story of murder and betrayal. Scored for two vocal soloists, men’s choir and orchestra, it was an instant success and launched Sibelius’ career when it premiered in 1892. At the time he wrote Kullervo, Sibelius was immersed in the music of Anton Bruckner and Richard Wagner, whose sweeping and emotional scores left an impression on the young composer during his visit to Vienna, Austria in 1890. But he also carried with him a lifelong fascination with other kinds of music, including traditional music with Finnish and Swedish roots: folksongs, church hymns, village band music and runo-song — music associated with the traditional storytelling of the Kalevala. To illuminate the roots of Kullervo, Dausgaard has invited three renowned Finnish musicians to be our guides: Ilkka Kallio, runo singer; Timo Alakotila, harmonium; and Vilma Timonen on the kantele, a zither-like traditional instrument from Finland. As a prelude to the performance, they and the Seattle Symphony will take us into the traditional musical world which might have inspired Sibelius when he composed Kullervo. I sat down with Dausgaard ahead of the concert to learn a little more about the program and his deep connections to this music. When did you first encounter Sibelius’ music? As a child, my experience of Sibelius' music was like entering into a mysterious, irrational and often slightly creepy world. It was music that I felt questioned my expectations, music which went its own way as soon as I felt I began to understand glimpses of it. I could enjoy the atmosphere of the Violin Concerto, but why this abrupt ending? I was taken by the liveliness of his Fifth Symphony but wondered that it almost resolved itself in the silent passages — and in the last chords. I loved the magnificent end of the Second Symphony, but how to find the red thread in the mosaic that preceded? That Sibelius' music was so mysterious to me was probably because I loved Beethoven the most of all composers. The way his music unfolded, was so obvious to me that it was like eating candy. Sibelius was more like trying to eat ice cream with salmon. All that I was attracted to in Sibelius’ works became a lever for me to get closer to his music — getting inside his universe and no longer skating around on the outside, where I could just enjoy the selected moments. Ice cream and salmon should become one! I love that description of “ice cream and salmon!” What finally pulled you into his music? The first time I conducted one of his symphonies, the second, it began opening up to me. Sometimes it has almost been a disappointment to see the score of a work that I have loved listening too. For example, I remember how Tchaikovsky's Fifth Symphony looked very boring on paper compared to the passionate power I experienced when I heard it live in a concert. How could all that pain and abandon look so simple and dry? Where was the blood on the paper? Not so with Sibelius. By the sight of his Second Symphony score, the context of the mosaic became so much clearer to me. I became excited about how he could spin the music forward — the way his music is organically evolving, as the tree sets branches and branches set leaves. The irrational element which had mystified me got a structure underneath, and I began to see lights and colors in the passages that I had most wondered about. To me, the music grew from being a coarsely incoherent set of events, to becoming a big breathing animal that could assume the most adventurous forms and expressions. What I had first found unbearable became what I loved most in his music. You have a deep interest in the roots of inspiration for composers. Could you share a little about the influences we might encounter in Kullervo? A few years ago, I did a Sibelius festival with my Swedish Chamber Orchestra and what we did with it deeply enriched my love for his music in a completely different way. Together with the wonderful violinist Pekka Kuusisto we lined up a number of leading Finnish folk musicians to dig into the possible musical roots of inspiration in Sibelius’ music. One these musicians, Timo Alakotila, was — thanks to his extensive knowledge of Finnish and Swedish folk-music, runo-song, hymns and much else — our Sherlock Holmes. I would send him themes or characteristic passages from the Sibelius works we would perform and, very surprisingly, he found corresponding material in the folk/runo/hymn tradition! These we weaved together in a mosaic, switching between Sibelius and what Timo had found, just as we will do for our performances of Kullervo. Getting to know these possible inspirations was a revelation to me and has given my approach to his music a new dimension, as I hope it will for you, as we invite you into the mysterious world of Kullervo and its roots. Explore the roots of Sibelius’ Kullervo with Thomas Dausgaard and the Seattle Symphony on May 31, June 2 & 3! Thomas Dausgaard’s performances are generously underwritten by Mel and Leena Sturman through the Guest Artists Circle. Thomas Dausgaard’s performances receive additional support from the Scan | Design Foundation by Inger & Jens Bruun.